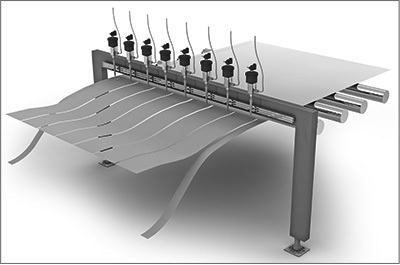 Water jet cutting technology has been used for several decades to perform paper cutting. In fact, this process supersedes the development of the abrasive waterjet used to cut harder materials such as stone, glass, and metals. Unlike abrasive waterjet cutting, however, only pure waterjet is used to cut paper and foods. The clean, very thin waterjet stream (thinner than a strand of human hair) does not cause the material being cut to absorb water, maintaining the integrity of the paper. The technology also does not create heat-affected zones while precisely cutting with speed. Thus, the efficiency of the process makes cutting with water jets an effective solution for paper manufacturers. In the early 1970’s the first paper cutting water jet system was used for paper manufacturing at Alton Boxboard in Alton, IL. Pure water jets were also used to cut paper-based materials and honeycomb for the aerospace industry. Waterjet cutting is very versatile and doesn’t discriminate in what is being cut! Paper thin materials, paper tissues, boxes, protective poly coating paper, corrugated cardboard, foam, paper sheets, food service paper, industrial packing paper, excelsior cushioning, bags, Tyvek, waxed paper, as well as food, and rubber can be cut just as swiftly as thin carpet. Because the diamond orifice is used to maximize cutting life, typically the size of the stream is a width of a human hair at speeds up to 3,000 feet per second. There is no water absorption during the slitting of paper products when water jets are used. Waterjet cutting with pure water is the ideal solution for the cutting and slitting of paper and plastic webs as well as cardboard panels. The technology is already widely used in the production of wallpaper and packaging material. The most common machine used in this field is called a slitter, which is a longitudinal cutting machine equipped with one or more pure water cutting heads. The material to be cut is transferred on a conveyor and is cut by the cutting heads located above the belt. In contrast to cutting with roller blades, the material is not shifted and there is no dust produced in the process. As the material is in contact with the waterjet for only a split second, its quality is not affected. The method is also suitable for the cutting of several layers of material. In this case, the operator must ensure that there are no cavities between the layers where water could collect. • Ideal for stacking materials depending on density of product. • Cutting nozzles can be stationary allowing paper materials fed through conveyor. • Omni-directional cutting. Minimal tolerances. No wasteful raw materials. • Cutting heads do not have to be changed out during manufacturing avoiding aggravating delays. • Minimal set up for automated cutting process and minimal downtime for quick seal change. • Is the material softened in the process? No, the material properties are not affected in any way. During the cutting process, the paper is only in contact with the waterjet for a split second. • At what pressure is paper slit? Depending on the thickness of the material, pressures from 43,500 PSI/3,000 bar can be applied.